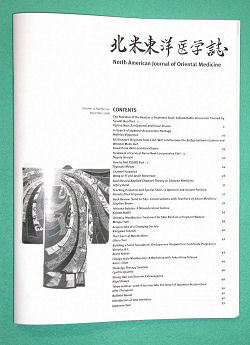 This magazine is the best magazine who practice in Japanese style acupcunture and moxa in North America. The articles are mostly written by the practioners who practice in Japanese style. It has not only showing treatment report of paractitioners' technique, but workshop report, book review, project report, and suggestions. You will know many people who practice Japanese style. You can share the experince, thought, and result. Why don't you join to the Japanese style world! The magazine is the first step of it. We have the backnumber of NAJOM.